Yesterday was a bank holiday here, so I almost forgot that today was Tuesday… the day I post my view to watch the changes through the year. I am glad I forgot until late though, as these photos taken early evening – around 7pm – are a useful record for me of how far the evening sun comes round at certain times of year. Forgive the glare, but I was looking westwards! There is little change since last week, although late summer is beginning to show with the grass on the left in full flower now. The red rose in the centre at the top of the rockery is happier with cooler nights and less rain and is starting to flower properly again. And my Gaura has finally really got going. It wasn’t keen on the damp weather we had earlier this summer. 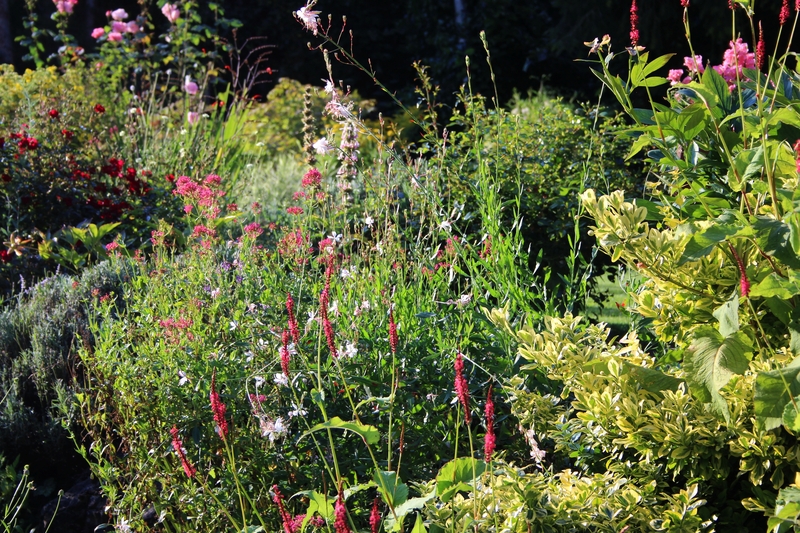 I love the way it sways in the breeze above the Persicaria. ← In a Vase on Monday: Put your Sunglasses on! Thank you Anca, and glad you could join me again! Cathy, I actually like the evening light better! It highlights the plants, making them easier to see (hint-hint for next week! 😉 ). 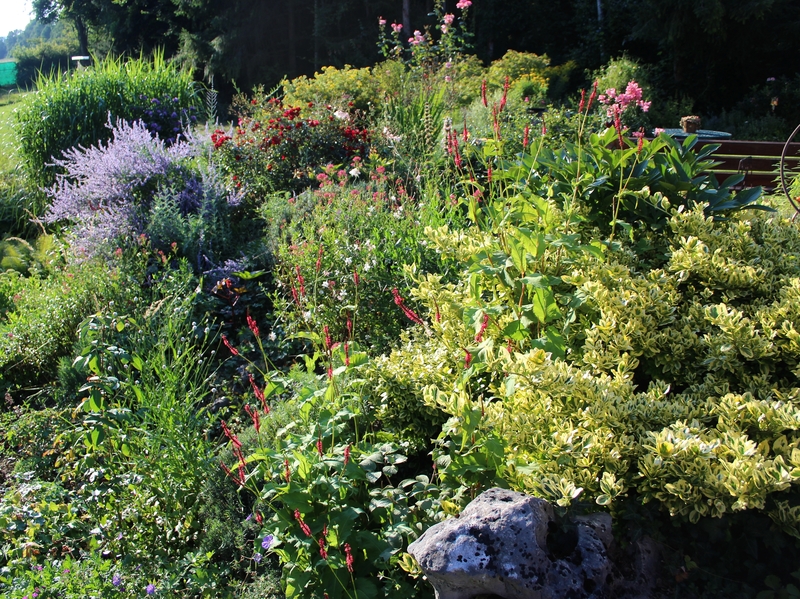 Loving the reds of persicaria and rose, and your perovskia makes me think I need to get this variety, as it has put on the longest show. Do you know its cultivar name? Okay, I’ll try and remember to get another evening view next week… 😉 That Perovskia is called ‘Blue Spires’ which along with ‘Little Spires’ (a shorter version which I also have but is not so showy) seems to be the most common one here. Thanks for joining me again Eliza! I agree, morning light is the hardest as it is quite harsh. 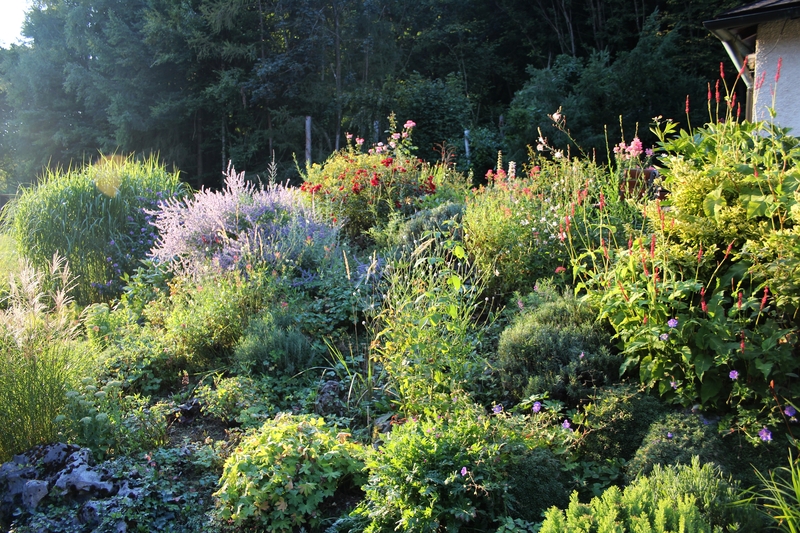 We have the evening sun shining directly onto the rockery from the west at this time of year which produces lovely effects but is also hard to capture as I am looking into the sun. Thanks for joining in again Christina! 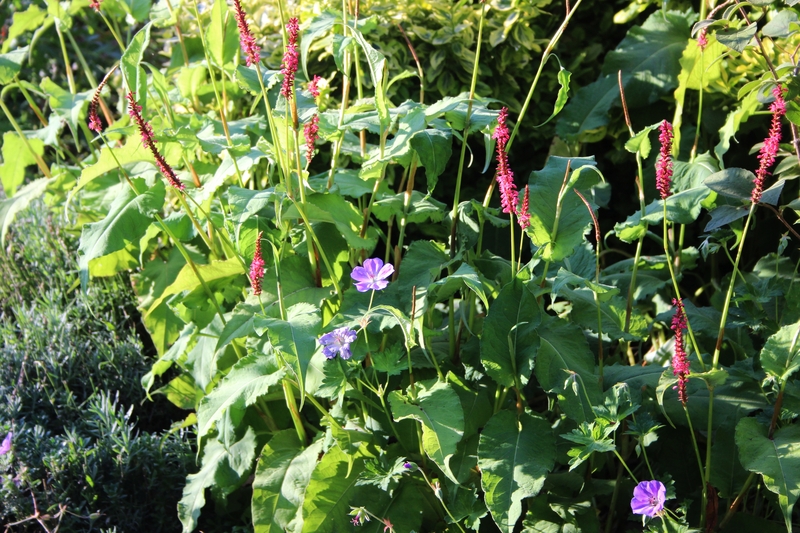 You have had such a hot, dry summer I hear, so maybe a bit of extra water would help your Persicaria. Mine has very sheltered roots under the Euonymus shrub, but always flowers better if it has been a damp year. Lovely! Though your picture reminds me that my ‘Rozanne’ seems to have gone into hiding. Mine stopped flowering for ages this summer but has just got going again. It still had flowers in November last year! Love the little exclamation points of Persicaria and the haze of Perovskia. Lovely evening light. The flowers seem to like the season. Beautiful scene! Missed this week but enjoyed seeing your flowers blooming for second time. Good idea with lower light levels the colours look superb. I think I shall try this next time although our hot dry spell is expected to finish at the weekend.rain coming . I shall try for another evening shot next week… depends on the weather really! Hope you get some refreshing rain Dorris! What a summery sight, even if it does have a sense of late summer to it. The colors are still so bright and the rain has brought on quite a lushness. I wonder how the rest of the year will go? We are hoping for some dry stable weather so we can get out onto the river with the boat one day. We haven’t been able to get on the water all summer for fear of rainstorms or mosquitoes!